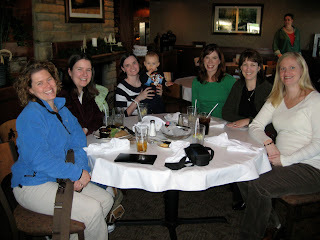 On Saturday, several of my girlfriends spent the whole day in Sevierville at the outlet mall. When you get six women together without children, there can be a lot of excitement. It is funny because we all look forward to our days or nights out together to be free of children and we usually spend the whole time talking about them. I'm so thankful for all of these ladies and enjoyed sharing a day with them. I'm glad you had fun and you look BEAUTIFUL!!!!! The pregnancy definitely agrees with you! FUN! Hope we get many of those times once you move back! I cannot believe how long your hair is!